Germany signed the surrender documents ending the greatest conflict ever to envelope Europe on May 7 in the French city of Reims. The fighting was to cease at 11:01 AM the next day. Six years of bloodshed were over. Word of the anticipated surrender had been circling for days. There were two celebratory false starts – one on April 28, another on the morning of May 7. Finally, the official announcement of the cessation of fighting was broadcast on the evening of May 7 and the world erupted in spontaneous joy. In London, the following day, the streets were filled with people and street parties. Bands played, flags flew and the air was filled with fireworks. At Buckingham Palace, Prime Minister Winston Churchill appeared with the Royal Family on a balcony overlooking an ecstatic crowd that packed the square below. The city brimmed with unbridled joy. "American sailors and laughing girls formed a conga line down the middle of Piccadilly." When the day finally came, it was like no other day that anyone can remember. It had a flavor of its own, an extemporaneousness which gave it something of the quality of a vast, happy village fete as people wandered about, sat, sang, and slept against a slimmer background of trees, grass, flowers, and water...Apparently the desire to assist in London's celebration combusted spontaneously in the bosom of every member of every family, from the smallest babies, with their hair done up in red-white-and-blue ribbons, to beaming elderly couples who, utterly without self-consciousness, strolled up and down the streets arm in arm in red-white-and-blue paper hats. Even the dogs wore immense tricolored bows...The bells had begun to peal and, after the night's storm, London was having that perfect, hot, English summer's day which, one sometimes feels, is to be found only in the imaginations of the lyric poets. The girls in their thin, bright dresses heightened the impression that the city had been taken over by an enormous family picnic. The number of extraordinarily pretty young girls, who presumably are hidden on working days inside the factories' and government offices, was astonishing...Strolling with their uniformed boys, arms candidly about each other, they provided a constant, gay, simple marginal decoration to the big, solemn moments of the day. The crowds milled back and forth between the Palace, Westminster, Trafalgar Square, and Piccadilly Circus, and when they got tired they simply sat down wherever they happened to be - on the grass, on doorsteps, or on the curb - and watched the other people or spread handkerchiefs over their faces and took a nap. Everybody appeared determined to see the King and Queen and Mr. Churchill at least once, and few could have been disappointed. All day long, the deadly past was for most people only just under the surface of the beautiful, safe present, so much so that the Government decided against sounding the sirens in a triumphant 'all clear' for fear that the noise would revive too many painful memories. For the same reason, there were no salutes of guns-only the pealing of the bells, and the whistles of tugs on the Thames sounding the doot, doot, doot, dooooot of the 'V,' and the roar of the planes, which swooped back and forth over the city, dropping red and green signals toward the blur of smiling, upturned faces. 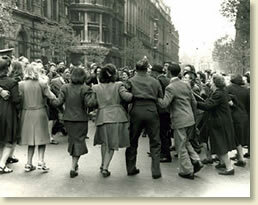 ...American sailors and laughing girls formed a conga line down the middle of Piccadilly and cockneys linked arms in the Lambeth Walk. It was a day and night of no fixed plan and no organized merriment. Each group danced its own dance, sang its own song, and went its own way as the spirit moved it. The most tolerant, self-effacing people in London on V-E Day were the police, who simply stood by, smiling benignly, while soldiers swung by one arm from lamp standards and laughing groups tore down hoardings to build the evening's bonfires...The young service men and women who swung arm in arm down the middle of every street, singing and swarming over the few cars rash enough to come out, were simply happy with an immense holiday happiness. They were the liberated people who, like their counterparts in every celebrating capital that night, were young enough to outlive the past and to look forward to an unspoilt future. Their gaiety was very moving." Mollie Panter-Downes' letter was originally published in the New Yorker Magazine on May 19, 1945, republished in The New Yorker Book of War Pieces (1947). 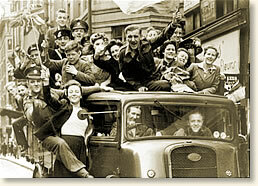 "London Celebrates VE Day, 1945" EyeWitness to History, www.eyewitnesstohistory.com (2007).